This time of year makes it fun to hear and learn about ghost stories and haunted places. Haddonfield is known to be a town with a number of ghost stories, having historical buildings and houses dating back to the early 1600s. The town even has a book written about the local spirits, “Haunted Haddonfield,” by William “Bill” Meehan. The Sun contacted Meehan, and he had two new, never before heard stories to tell. One is about a ghost that occasionally appears at a Kings Highway church, and another is a ghost that haunts a house on Lane of Acres in Tavistock. “These stories all take place in Haddonfield and are all true in the sense that my sources believe them to be,” Meehan said. Some of Haddonfield’s oldest buildings were religious ones. As the town grew, many of the religious buildings were relocated either in parts or in whole. This particular church on Kings Highway has part of its old building within the current structure. A number of years ago, the church’s organist, a lovely older woman, passed away, and shortly after she died, there were some interesting occurrences at the church, Meehan said. One night, a young child was waiting to start her piano lesson in the church, and her music teacher told her to wait in the piano studio and practice, as she was talking to another instructor. The young girl returned quickly, saying there was an elderly woman playing the piano in the room. The teacher, confused, went to the room and saw the deceased organist playing the piano. As she continued to stare, the woman suddenly vanished before her eyes. This was not the first or last time someone saw her. A few years later, a music teacher was locking up the church for the night when she saw an elderly woman sitting on a bench in the church. The teacher asked if she was waiting for someone or needed a ride home, but the woman did not respond. The teacher continued to lock everything up, and came back to see the woman still sitting there. When she asked if she needed a ride or to call someone, the lady again did not answer or move. The teacher decided not to completely lock the building so the woman could get out. When the teacher came in the next day to ask about the woman, the church staff did not know about whom she was talking. They brought out a directory with photographs and found the picture of the woman she was talking about. It ended up being the deceased organist. According to Meehan, a number of people have seen the organist. The next haunting is a house located not far from the entrance of Lane of Acres, at what used to be the Tavistock farm. The house was built in the 1960s, and the owner of the house in the 1980s was an older woman who was very ill and decided to spend the rest of her days on the first floor in the dining room. The heirs rented the house to a couple who now lives there with a preschool-aged child, at the time. Not long after moving in, the young son would say he was tired and “she would not let me sleep.” The parents were confused as to what the boy was talking about. Eventually, the boy told his parents the name of the woman, Helen. The wife was always a believer in spirits, but the husband was not, and just brushed it off. However, he too started to see and hear strange things. The family would find old fashioned bobby pins in strange places, lights would flicker and cabinets would open and close with no one touching them. One day, working in his office on the second floor, the man was overcome with a tremendous headache and leaned over his desk to cradle his head, when a hard breath blew across his neck and gave him a sickening feeling that he wasn’t alone. After that, he and the family abandoned that second-floor office and now avoid it when they can. When it came time for a roof repair, the family joked that they hoped it didn’t upset Helen, and, immediately after, the old sound system, no longer in use, turned on and blared white noise in response. Last Meehan heard, the number of events was steadily increasing. “It doesn’t matter if you’re alone or together, Helen makes her presence known. The wife continues to be a believer; the husband was not, but now he is,” Meehan said. Meehan did not wish to include the exact locations and names of those involved, as to protect their privacy. Meehan said these are just a few of the many stories he has been told by residents or found out about by the Historical Society of Haddonfield. He even has enough stories to do a second book, which he may write. 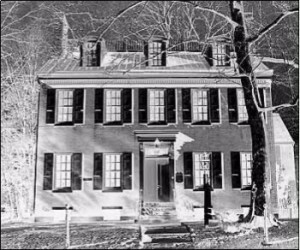 If you’re interested in more ghost stories and legends, join Meehan on a walking tour of Haddonfield with the Haunted Haddonfield Walking Tours, coordinated by the Historical Society of Haddonfield. The tours begin at 7 p.m. at Greenfield Hall and wind past the cemetery and familiar homes along the way. The tour lasts about 60 minutes and can be enjoyed by everyone. “I do refresh the stories, and usually there are new ones each night, as I vary them from night to night. Depending on the night, it won’t be exactly the same. I try to make it as intimate as possible,” Meehan said. Tickets are $10 for adults and $5 for children under 12. Tours will be held on Oct. 21, 22, 28 and 29. Advance tickets can be purchased at the Historical Society during open hours, at the Haddonfield Public Library and at the Visitors Center. Tickets will also be available at the door, cash only, as space allows. Please remember to wear comfortable walking shoes, bring a flashlight and wear light/reflective clothing as a safety precaution. All proceeds from the Haunted Haddonfield Walking Tour and “Haunted Haddonfield” go to the Historical Society of Haddonfield. To learn more about the Historical Society of Haddonfield, the Haunted Haddonfield book and the resources available through the society, visit haddonfieldhistory.org.